2.Equipped with Deep Sea,ComAp,Harsen,Smartgen famous control systems. 3.New integrated controllers in manual and remote start application. 4.Featuring full gen-set monitoring and protection. 6. High functionality set new standards in gen-set control. 7.Special low temperature version is also available. 8.Allowing the display to work up to -30°C. Manufacturer: Chongqing Cummins Engine Company Ltd.
2) Brushless alternator,single bearing,flange connection,IP23,H insulation class,with AVR. 3) Auto control panel with LCD display. 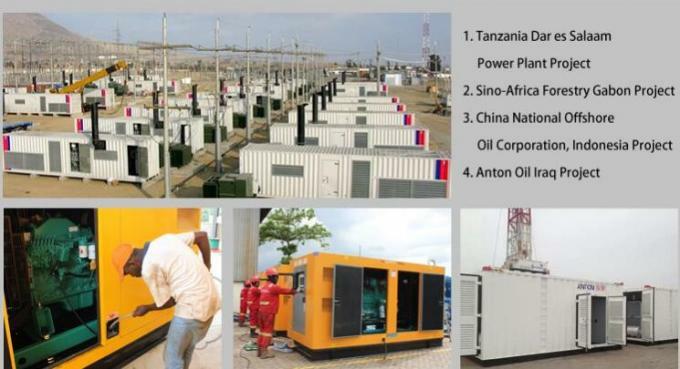 4) Engine mounted battery-charging alternator,Genset with battery charge of main supply. 6) Copper Radiator for 40°C ambient temperature and double-deck cooling,with fan guard and front guard. 7) Anti-vibration pads fixed between engine/alternator and base frame to ensure the compete genset running stable. 8) Skid-mounted bottom 8 hours fuel tank. 9) Extemal recessed emergency stop button for extra safety. 10)Optional:Soundproof,ATS(automatic transfer switch),AMF panel,Trailer,Parallel system.